Old-school fruity machine that made the common people millionaires back in the days of the one-hand bandits now is available for anyone to play online. Stakelogic packed up a fast-paced mixture of retro and modern into a 5-reel 3-row 40-payline slot machine that pays up to 32.000 coins you can score with Wilds and the innovative Supermeter mode. 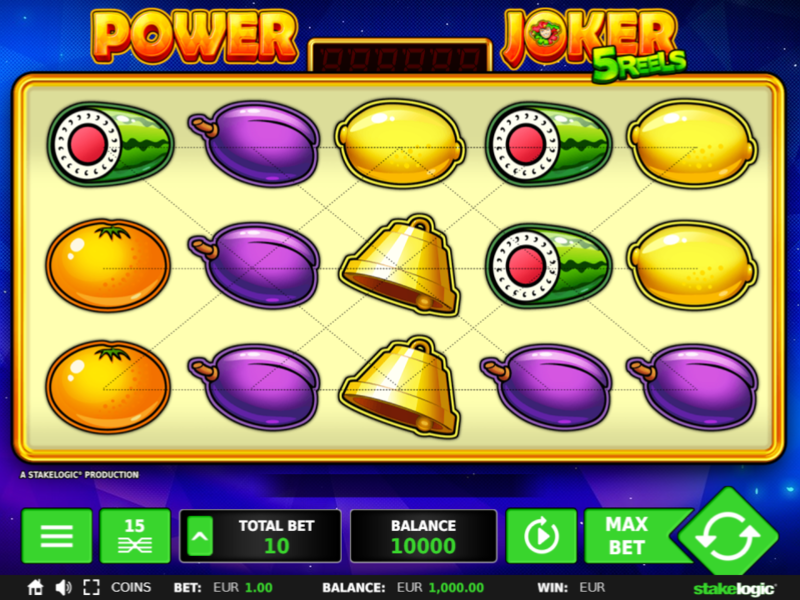 Even though the Power Joker Free Spins are not an option, there’s still lot of room to boost your bankroll, so make sure to read the Power Joker slot review and find out how to win. Want to see how Power Joker works? Select a recommended casino site from the list below and start playing for free or real – our screenshots will give you a sneak peek! Start by selecting the coin value that goes from €0.01 to €2. This allows each player to define a working strategy and wager between €0.10 and €20 per spin. Arguably, Joker has the highest rating of all symbols on the paytable. Its dual nature allows him to substitute a symbol missing from a winning combination but also to help you score a big win. Here are some tips to receive between 1.000 and 6.000: just get 3 Jokers on an active paying line and see the Mystery Win activates to pay the prize. Each time you form a winning combination, Supermeter Mode activates giving you a choice to collect the winnings or keep playing. This mode grants much better odds, also making all Wilds Stacked to help you form even more combinations. Mobile gaming works as a charm even without having to download a native app for iPhone or Android. Sites powered by Stakelogic allow you to play for fun or for cash directly from a browser. 3. What is the RTP factor of Power Joker? The RTP stands at 95.00% in the base game, or 98% in the Supermeter bode, according to the official info. Even the first encounter brings the memories back – if you’re an experienced player, of course. A younger generation will enjoy the overall atmosphere and retro design, but no matter how many winters you saw, this is a machine that posts nothing but a challenge. Try to beat it, why not.